Transcat is proud to offer the nation’s largest inventory of Fluke tools and serve as an industry leader in the repair and calibration of Fluke test and measurement instruments. Transcat repair technicians have specialized training in repairing a broad range of Fluke models, including the manufacturer’s most advanced equipment. Our full-service Fluke repair center encompasses sales, support, service and accredited calibration services. In fact, Transcat’s world-class metrology capabilities include decades of service experience due to our decades-long partnership with Fluke. Our quality Fluke product repairs come with opportunities for low-cost and flat-rate services, with the most rapid turnarounds possible. We will skillfully repair your Fluke instruments, including Fluke digital multimeters, process calibrators, thermal imaging cameras, pressure gauges, data loggers, and other critical tools. Why Transcat’s Fluke Repair Center? We can be your single repair center, servicing and calibrating your entire Fluke inventory, no matter how diverse. If your instrument cannot be repaired, our skilled sales team can assist you in selecting a replacement instrument. Transcat is your single source. You’ll benefit from fixed rate pricing that lets you easily budget for repairs. If an instrument does not qualify for a standard rate, we’ll evaluate the tool quickly and then provide a detailed quote. All Transcat repairs also come with an accredited calibration and certificate. You can choose the preferred ISO 17025 Accredited Calibration Service level that meets your requirements. Our rapid repair turnarounds and proactive services offer an attractive alternative to the often time-consuming OEM process. We also make it easy for customers to follow the progress of a repair online. 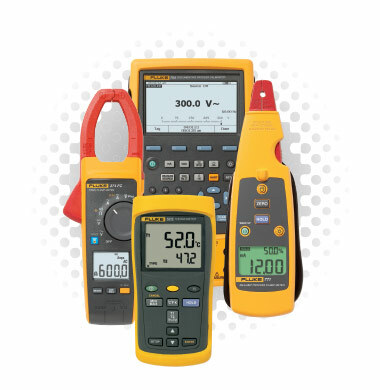 We deliver industry-leading calibration and instrument repair services on instruments built by virtually every major tool manufacturer, from Fluke to Meriam, at affordable prices and with an unparalleled quality commitment. To receive a quote on your instrument repair, please complete our Quick Quote Request Form. You can also use our Live Chat, which is located on the right side of the page, or call Transcat directly at 800-828-1470.